Let it sit on the counter in a glass jar with a lid on for three or four days. Strain and refrigerate and drink. In this photo you can see I left the herbs in the tea while it fermented. You can strain it before or after fermenting and it's fun to try both. The jar on the right is our Catarrh tea and the one on the left is nettles with ginger and cranberries. I didn't cook the cranberries but next time I would to get more flavour. This lovely pink drink is made from our Tea Party Tea which is sumac, elder flowers and red clover. It was delicious. Other favorites include blueberry with lemon, ginger and lemon and our 5 Mint Tea. I got my recipe from Sally Fallon's book Nourishing Traditions and I also tried her recipe for ginger beer which is a bit more complicated but delicious. It involves making a 'ginger bug' which you feed every day for a week with ginger and sugar. I used honey instead of sugar and it seemed to work just fine even though honey is antibacterial. I guess at some point the wild bacteria are stronger. Here's a great website that tells you in more detail how to do it. I have really enjoyed the process and have plans to try all kinds of combinations this summer as more fruits are available. I'm just about ready to try rhubarb ginger next! The bees have been working away on all kinds of flowers. Here's a male hazelnut flower with a honey bee on it. See the spider on her web in the background? The female flower of the hazelnut is a tiny bright purple hair! There aren't any in this photo. The pollen from the catkins blows around in the air and pollinates the female flowers which grow into hazelnuts. Last year was our first harvest of hazelnuts and it was great fun for the kids. The trilliums in our woods were attracting a lot of honey bees. I lay down on the forest floor to photograph them. The sound of bees buzzing all around me was gentle and lovely. They were gathering lots of bright yellow pollen from the trilliums as you can see on the bee's hind leg. 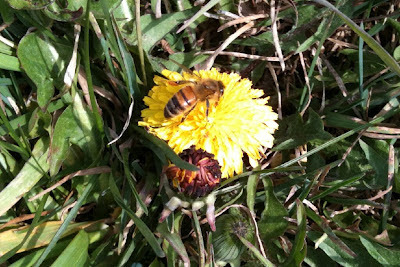 You have to walk carefully through the grass when the dandelions are blooming. 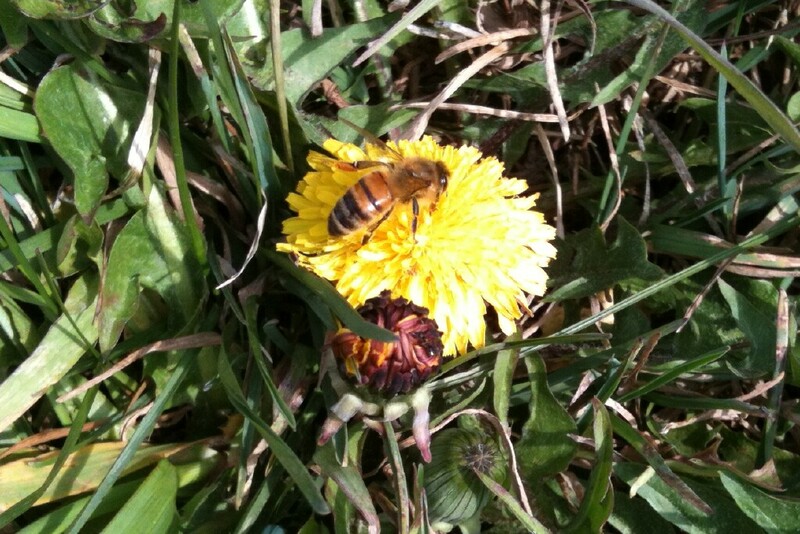 The bees love dandelions and harvest a bright orange pollen from them. We've been eating a lot of dandelion greens this year. I add them to salad, saute with garlic, puree in soup and bake in quiche. Dandelion helps you detox so it's a good spring cleanser. Stinging nettles are another spring green we eat along with the dandelion greens. When you cook them it gets rid of the stinging so don't try them in salad. No bees on the nettles since they aren't flowering yet. I've never noticed them on the nettle flowers before but I'll be sure to check this year. I think the flower isn't noticeable enough for the bees to be interested though. I tried a great recipe from Plant Healer Magazine for buckwheat pancakes. You soak buckwheat groats overnight and drain them in the morning. Then puree them in a food processor, add salt and thin with water until it's the consistency you want. Cook like pancakes. They take a bit longer to cook than traditional pancakes. They have a wonderful flavour and if you make them thin like crepes they're good for wraps. I tried them with yogurt cream cheese and sauteed nettles and garlic. Wow! For those who don't eat gluten these are gluten free.